I recently learned a fact that in all my years of eating packaged bread I had never known. It was news that would change my life—or at least how I buy bread. Like most families, bread is a staple in our diet, along with milk, butter and Ring Dings. We eat BET’s (Bacon and egg on toast) for breakfast, PB&J’s for lunch, and BLT’s for dinner. We eat so much bread we’ve run out of abbreviations. 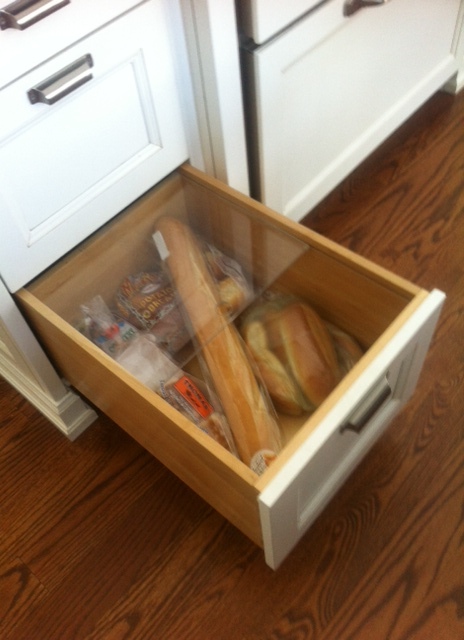 Bread is so vital to our family that when we designed our kitchen we created a bread drawer. Our bread drawer stores anything yeasty that doesn’t require a visit to the doctor. It keeps our bread organized, which means it provides a place for rolls, loaves and hot dog buns after my family takes them out and leaves them on the counter. Crumbs find a home there too. To help ensure that our bread stays fresh I adopted a color-coded system, which is simply: Examine the bread and toss it out if it’s green. It was on a “Did you know?” information website, though, that I discovered the ultimate key to freshness. You know those colored clips from the grocery store that keep the bread wrapper closed that your children never clip back on the package? The ones you use as poker chips, guitar picks or the reason for getting your garbage disposal repaired? The bread code was invented to make stocking easier and more efficient—and to help keep garbage disposal repairmen in business. The system has been in use about ten years—which is approximately when I bought the package of rye bread I found in the back of my bread drawer last week. You may be curious about whether the code is universal. Many but not all grocery stores use the tabs. Some stores use wire twists, or they use another system— they place stale bread on sale. When I discovered the bread code I couldn’t help but wonder, how is it possible that I know things like: always cook pork, fish must have water, and life is easier for pretty people, but I didn’t know what plastic bread tabs meant? The answer, I concluded, was that God works in mysterious ways. And so does Shop Rite . . . If this stunning revelation leaves you with additional burning questions, keep reading. Q. Why is there no color code for Wednesday and Sunday? A. The bakers’ and drivers’ wives insisted they take a few days off to help out around the house. Q. The bread manufacturer I like uses the same color tabs with dates. Is that the day it was baked? A. No, that would be the sell-by date, unless it says April 1 . . .
Q. How do I guarantee that my bread is fresh? Q. How do I remember the B-G-R-W-Y color code when I can’t even remember the difference between whole grain and whole wheat bread? A. You can use this pneumonic device: Bulgarian Goats Rejoice With Yorkshire pudding. Or, you can just print and keep the color key of freshness shown above. Q. Is this bread color code thing real? A. If you don’t believe me, ask Snopes. I wondered the same thing, I feel like I’ve been in the dark, along with my stored bread. A suggestion: either make or buy bread dough. It keeps really well in the freezer and you can make just enough for maybe two days. You get fresh bread, the kitchen smells wonderful and you throw off the chains of processed products. This is amazing piece of information. I NEVER knew this. I wonder if there is a similar system here. Somehow I doubt that there is, but it would be a great system to adopt. Thanks fro sharing! I’m guessing the system in Ecuador is fresher and fewer packaged foods, no? We also eat a lot of bread products. Now I found out many bread products actually have plastics in them to give them a more pleasing texture. Oh well, like balogna, ignorance is bliss. Soon I fear we’ll be skipping the bread all together and just eating the bag. The other day I tried a piece of my wife’s weight watcher bread. I thought I was eating the bag. Good to know. While we’re talking bread (and no not ” bred “) something else I’ll pass on: I’m a bread addict also so when I find it on sale I load up and put it in the freezer where it will keep for …………well, don’t know how long it will keep. I have had some on ice for over a week and when defrosted, is almost a fresh as when I chunked it in the freezer. I just fed my kids a couple of bagels from our freezer this morning. I even defrosted them first! How much more can be ask of a mother. We also freeze bread. As long as the freezer is not self-defrosting, bread will keep for quite sometime. “Bread drawer stores anything yeasty that doesn’t require a visit to the doctor” – LOL!! so funny and I feel your itch/pain with family leaving it all on the counter. There is a system here, people!! There’s more crumbs on my counter than La Boulangerie. Throwing away green bread? You can make a different kind of green bread with it – just sell it to some lazy kids as a last minute science fair project! Or save it for St. Patrick’s Day! Slap some corned beef and mustard and there you go. Gah! It’s a good idea if you’re curious how fresh the bread is in the store, but it still doesn’t beat looking at the sell by date, since the bread on the shelf could have a tag from the previous week. I buy that bread when it’s on sale and I freeze it, so those tags become useless by the time I take the bread out of the freezer. One thing I’ve realized over the years is that bread keeps a lot fresher and longer in the fridge. But your family eats so much bread, you probably never run into that problem! The way my family goes through bread we should own stock in Pepperidge Farm. I think bread is to be eaten, so if it’s on the counter, I’m gonna snag it and eat it! I have a friend whose muffins kept disappearing from her kitchen counter. After week’s of accusing her kids of taking them, she set up a video camera and realized it was the dog. I like your built in bread drawer and the Q and A. I’d heard about this strange bread SOS but then forgotten it. As I’m apt to do again. Nice to hear from you Lisa. I like your bread drawer too. The Q and A is cool! Green means go…directly to the trash. We buy bread every week and admittedly wind up tossing a few slices each week in the transition. It’s not the fear of chomping down on penicillin. Rather, it’s the joy of enjoying the freshest bread possible. There’s nothing finer than fresh bread, except fresh bread and butter. Thanks for the info, Lisa. Our store, sometimes, doesn’t even put the sell-by date on the bread. That rattles me. Here’s a tip I learned: Italian bread – and other crusty breads – are crunchier when you keep them in a brown paper bag. The bread appears to become softer in a plastic wrap. Ah, yes, that would explain why the dozen bagels I buy are placed in a brown bag. Nothing like fresh bagels on a Sunday morning! How have I lived so long with this knowledge gap? What prompted you to research this? I randomly came across the information on the Internet. I love to learn random facts. Now if only I could remember them. Wow – you are a code cracker! I never knew this! What a fun & informative post. Gotta run…I’m on my way to the market & I’m totally gonna check out the bread aisle. Pretty jealous of that bread drawer….who knew about the color coding? My bread drawer helps keep all my bread in one place–on the kitchen counter. Love your Q&A though…I am certain it helps and I think it is a well kept secret…. I like the idea of a stamped date. Much easier than trying to remember a code! Awesome post! I learned a lot, and had a laugh, too. Love the bread drawer idea. I knew about the color of the tab things but using those tabs for guitar picks… genius!!! Once upon a time a seious baker decided bread was the staff of life. OR, it could be the laff of strife, depending on your enthusiasm. To me bread isn’t particularly desirable but in some instances it rises to the occasion. Must check out the color coding thing. I wonder if it works for pumpernickel? Note: Unleavened bread doesn’t seem to age until next Passover. Excellent information! Especially the bread color code! Thank you and regards.